Solid steel case padlock with a 3" chain is made to exacting U.S. government standards, offering superior protection. Sturdy design provides resistance to bump attacks so the padlock is recommended for high-security areas. Included five-pin cylinder offers added security. Padlock is made of hardened boron steel. 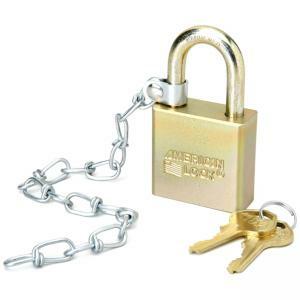 Rekeyable padlock also includes two keys and measures 1-3/4" wide with a 1-1/8" shackle height.